NOTE: While trade in animation cels is brisk and items often command top dollar, one does need to exercise some caution here, as counterfeit (ie, manufactured) cels have been known to be touted as true cels. Often all it takes is a skilled copy artist with a clean image and some transparencies to produce cel look-alikes. As in all things of this nature -- let the buyer (or collector) beware! Here are some cels which are technically not from any produced episodes; often cels such as these are produced by the studio as "specials", sericels, publicity cels, or limited editions. Not as rare as production cels, but still collectible. While not a production cel from the original show (it never appeared in any of the episodes), this image is very popular, being a specially drawn image of the main characters from the show. 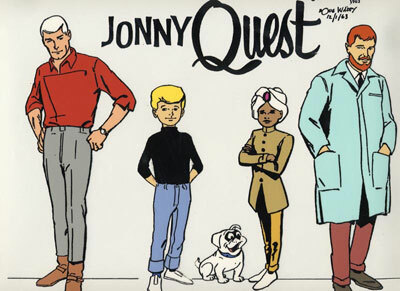 Following is the description from the seller: A Jonny Quest limited edition cel. It's #20 of 200, measures 16 1/2 inches x 13 1/2 inches, has a seal and signed by Hanna & Barbera. It has a color print background. NOTE: Not all of the item is shown in this image; most notably, the signatures at the bottom (as seen in other reproductions of this painting) are missing. The top of one signature can be seen near Jonny's left foot, so presumably it was just cropped from the image displayed by the seller. Here is another cel seen fairly often; this publicity cel uses character models very close to the original models. 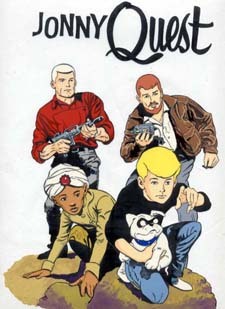 The original version of this image (with Jezebel Jade in the background) was used in producing a T-shirt design offered by the Comico comic company in the mid-1980s as a promotion for their forthcoming Jonny Quest comic book series. 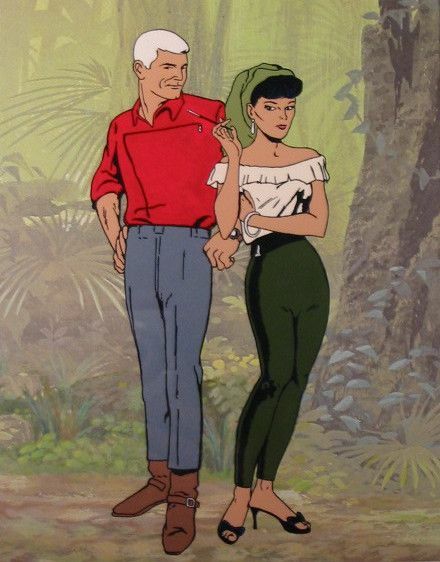 The original image was created by Doug Wildey, and is very popular, having been seen in both black-and-white and colored versions (usually without Jezebel Jade). Although created by Doug Wildey, it is not from the original 1964 series, but was developed a number of years later. This type of cel was used to provide a reference for the artists and animators of the episodes. Characters from "Quetong Missile Mystery"
Although this is technically not a cel from any of the original episodes, the black-and-white source for this image has been seen in a number of other publications. It is known to have been drawn originally by Alex Toth, who worked on the series. "This is an original, hand-painted, one-of-a-kind character cel from the original Johnny (sic) Quest animated television series, produced in the 1960s. 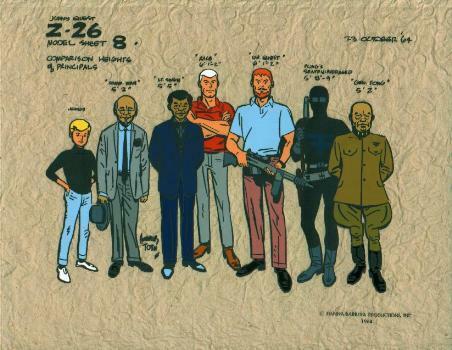 A lineup featuring all of the original characters, both protagonists and antagonists, of the episode 'Quetong Missile Mystery,' it was illustrated by Alex Toth in October, 1964. Approximately nine inches tall by twelve inches wide, this is the type of art cel distributed to artists on the series for reference." Note that no claim of authenticity is claimed; it is possible that this "cel" was produced by using the B&W sketch from Alex Toth as a starting point. Regardless, it is a very clean image with good color through-out. Additional note: After posting the above, I received an e-mail from Joe Tumminelli, who purchased the cel, in which he described in some detail how he had checked out the seller and the cel before his purchase. After reading what he wrote, I'm pretty convinced the cel is an authentic one. Joe also states that as for the size of the cel, it is matted, but the aperture of the mat measures 9-1/2 by 7-1/2 inches. The actual image measures 8-1/2 by 5-1/2 inches. "This hand-painted cel is from the 1964 Hanna-Barbera cartoon series, 'Jonny Quest,' which was designed by famed comic book artist, Doug Wildey. 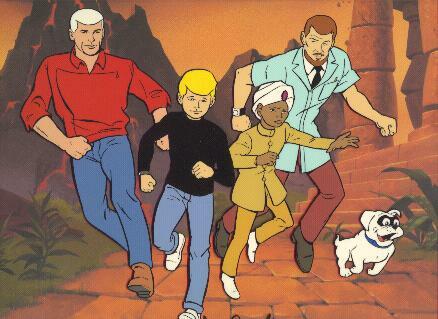 Featured in this cel are Race Bannon, Jonny Quest, Hadji, Bandit, and Dr. Benton Quest. Cel is marked 'Doug Wildey 12/1/63' although from the mint condition of the cel, I'm not sure when it was produced. This was in a file filled with loose cels that I was given by an artist who used to work at the studio. Other than a little bit of wear on the black line around Jonny's sneaker, it is in great condition! Cel is 10.5 inches by 12.5 inches which is the standard size of an animation cel. Cel has not been peg-punched, making it the perfect image to frame and add to your Jonny Quest or Hanna-Barbera collection." 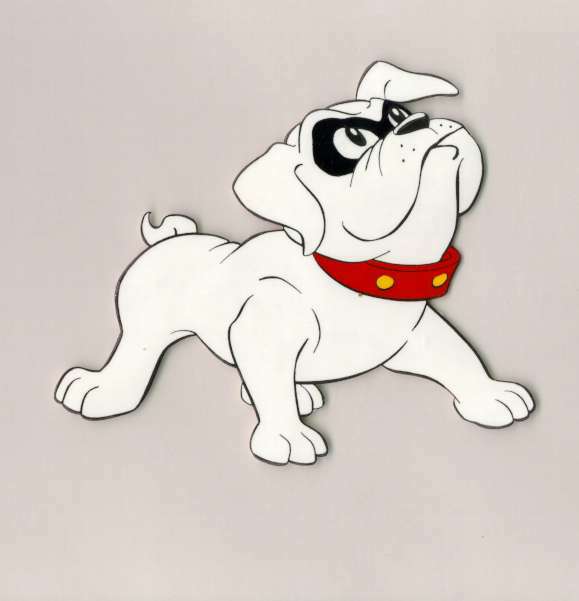 This cel was constructed by taking several character model sketches and painting them, then placing the transparent overlay on a painted background. The cel owner honestly stated up front that the cel did not represent a scene from any episode. This appears to be a nicely rendered item, but, it is definitely not a genuine production cel, although the faithful reproduction of the character models and the excellent background painting makes it seem like it could be. For a comparison, check this set of figure models for Jade. Notice how the leftmost and rightmost models in this image can be (and likely were) combined to form the single character model in the "cel." Next, check out this page of Race figure models and this page of models to see how the body from the rightmost figure on the first page was combined with the head at lower left on the second page to create the figure seen in the "cel." About the only item in doubt is the background painting -- ironically, it could be real! It certainly looks like one of the many jungle backgrounds seen on the show. Read my reply to Dan.